You’re laid off at work. Your car needs a new transmission. Your furnace blows. These are all costly emergencies that can’t usually be anticipated and cannot be avoided once they occur. Without a fund set aside just for such emergencies, they can trigger even greater disasters. Last year, NeighborWorks America released the findings of its third annual consumer finance survey. Chief among them is the alarming fact that nearly a third of adult Americans (29 percent) have no emergency savings. Ninety-one percent of those with incomes of $100,000 reported holding emergency savings, compared to just 30 percent of who earn less than $20,000, 63 percent of those with incomes below $40,000 and 78 percent of those with incomes between $40,000 -$50,000. There also were significant differences by race and education. The highest percentages of households without any emergency savings at all were reported by African-Americans, adults with lower incomes, and among those with a high school education or less. A good rule of thumb is to have enough funds set aside to cover three to six months (some say four to seven) of living expenses. This will give you enough time, for instance, to find a new job or supplement your unemployment benefits until you do. However, anything in the bank is better than nothing — and $500 will get you out of many scrapes that would otherwise put you in the hole. In other words, start small if you have to, but start. Set up a savings account just for this purpose. Separate it from the accounts you tap into on a regular basis so you’re not tempted to dip into your reserves. Do not get access to it via debit card. And if you are issued a checkbook, hide it. Arrange the automatic deposit of a portion of your paycheck into that savings account. Most employers allow direct deposits into multiple accounts. This is the most painless way to create a regular savings habit; you won’t even notice it! But make sure you’ve created a realistic budget. Otherwise, you’ll be pulling money out of savings regularly to pay bills, defeating the purpose. Keep the change.When you get $1 and $5 bills after breaking a $20, drop some in a jar at home. When the jar fills up, move it into your savings account. And if you have money left after paying your bills at the end of a pay period, move some into your emergency fund. Save your tax refund. 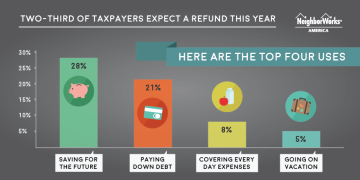 The average refund is in the thousands, which can give a good boost to your emergency savings. When you file your taxes, consider having your refund directly deposited into your emergency account. Alternatively, adjust your W-4 tax form so that you have less money withheld, and direct the extra into your emergency fund. Cut back on costs.If you’re still falling short on saving, track your spending for a month to find discretionary expenses you don’t really need. Meals out, stops at coffee shops, drinks with friends all add up fast, but you may not realize how much you’re spending in total until you’ve put it on paper. Remember: Expenses you should be able to anticipate, such as holiday gifts and annual auto insurance payments, are not emergencies! One of the most common problems people have with emergency funds is forgetting to plan for one-time expenses each year. Members of the NeighborWorks America network of nonprofit housing and community-development organizations offer financial education and coaching to help you follow these guidelines. Emergencies are upsetting enough. Don’t allow them to turn into financial catastrophes as well.